I attended LinuxTag 2014 in Berlin. The event reinvented itself again, after it lost attraction is the recent years. We, GNOME, couldn’t even get enough volunteers to have a presence there. In Berlin. In perfect spring time. Other projects were struggling, too. For this year, they teamed up with re:publica and AndroidCon. The venue changed and the new format of the event made it more attractive and made a good number of people attend. The LinuxTag deserves its name as it’s unusually kernel focussed for a “normal user” event. As in depth kernel session do not necessarily make sense for the every day computer user, teaming up with DroidCon seemed promising. But the two events were too separated. I actually have not seen any schedule for the DroidCon. And I couldn’t find a joint schedule anywhere on the Internet nor in the venue itself. I don’t think it’s bad intentions, though. It’s probably due to lacking resources to pull it off. A big thank thank you to the organisers. I think it’s an important event that connects many people, especially those from the Industry with the Community. Keep rocking, guys. At this time of the year, there is a special thing happening in Berlin. It’s the annual LinuxTag, a mix of conference and expo. And again, we (GNOME) had a booth. We shared the space with our friends from Qt and KDE, as we already did for last FOSDEM, and we got along quite well. It’s good to see friends again and again. The critics from last events, i.e. FOSDEM and LinuxTag, were incorporated. So I did get enough tape, glue, T-Shirts and even a rollup-display *yay* Thanks to the GNOME Foundation for providing resources. However, compared to last year we had less material, because only one EventsBox was available and we had less furniture for the booth, because LinuxTag lacks sponsors. So we had to deal with non ideal situations, but well, that’s how it always goes, no? And as we are engineers, we managed quite well, I’d say. Unfortunately, we didn’t have any GNOME talk, so this is something that is definitely to improve for next year. You can already think about cool things to present in lovely Berlin. Interestingly enough, the computer, we used to demo GNOME, was very stable. Obviously, I wanted to show the freshest GNOME release, which was 3.4, but so far no distribution had a stable release which included the newest GNOME. So I used a Fedora 17 Beta and well, some things crashed (reliably) but it was still very smooth. The webcam was the most annoying piece of hardware. But well, it was stolen quite early so we didn’t have to bother too much about it So yeah, if you happen to have a spare webcam that works with a recent Linux and Cheese, we’d happily incorporate that into our EventsBox. Generally though, people were interested in the newest developments and we had nice chats about the past and the future of GNOME. Unlike last year, we probably did not convince anybody to go to GUADEC (as it’s now in Spain and not in Berlin) We also couldn’t convice too many people to buy T-Shirts. The dark green one from second last FOSDEM were quite popular but as they are old, we only had 4 to sell. A big thank you to all the people helping out at the booth and of course to LinuxTag for providing us with the opportunity to present ourselves. The talks I’ve seen, which were not many, as I’ve spent much time at the booth, were not really exciting. I’ve seen Ulrich Drepper talking about Lock Free Data Structures on modern CPUs which was, well, a bit slow for me. He seems to be very knowledgeable but I think he presumed the audience not to be. Anyway, apparently modern Intel CPUs can do transactional memory and you can even now write code that uses that feature in the future while staying compatible with today’s CPUs. You need a new enough toolchain though. Some other guy talked about forking. I was curious but he delivered his story about forking Nagios only. He didn’t mention any problematic fact at all and was mainly concerned about establishing an own brand. I followed “Distro Battle” for a short period of time. Basically, five contestants were about to solve some problems a user could face with her distribution. So Mageia, Fedora, Debian, Kubuntu and OpenSuSE with their respective representative should solve problems like “install this printer” or “use this 3G USB dongle”. They had the chance to introduce themselves first. Mageia was running LXDE, Fedora had a GNOME 3.2, Debian a GNOME 2 and Kubuntu and OpenSuSE were running some recent KDE version. The Kubuntu representative introduced her distro by showing how easy it was to install the whole non-free packages and by stating this would be the very first thing you wanted to do on your fresh install. Funnily enough, Kubuntu self-destructed with a reboot into memcheck. Apparently, she aborted the install at a very unpleasant moment while there was no kernel ready. So the GRUB menu didn’t have any other option than memcheck. The non-GNOME desktops failed getting the 3G dongle to work while NetworkManager sorted that out on the GNOME desktops. The printing failed completely in OpenSuSE because they used their Zast-Tool; and Debian had a minor issue with ZeroConf not working. So it’s quite a funny concept this “Distro Battle” although nowadays the GNU/Linux base is rather streamlined, isn’t it? So it doesn’t matter much which distro you use in order to get a printer or 3G dongle running unless you try to implement your own stuff. 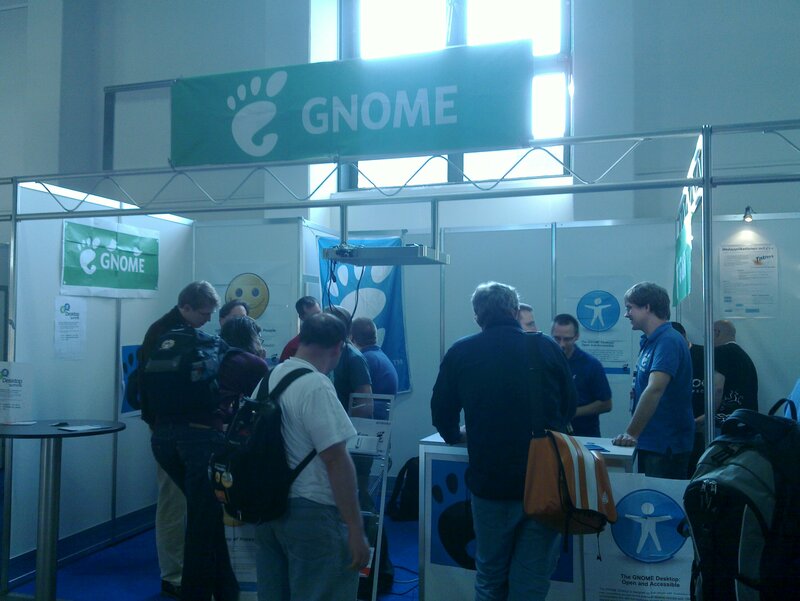 Last week, I had the pleasure to attend LinuxTag and manage the GNOME booth. 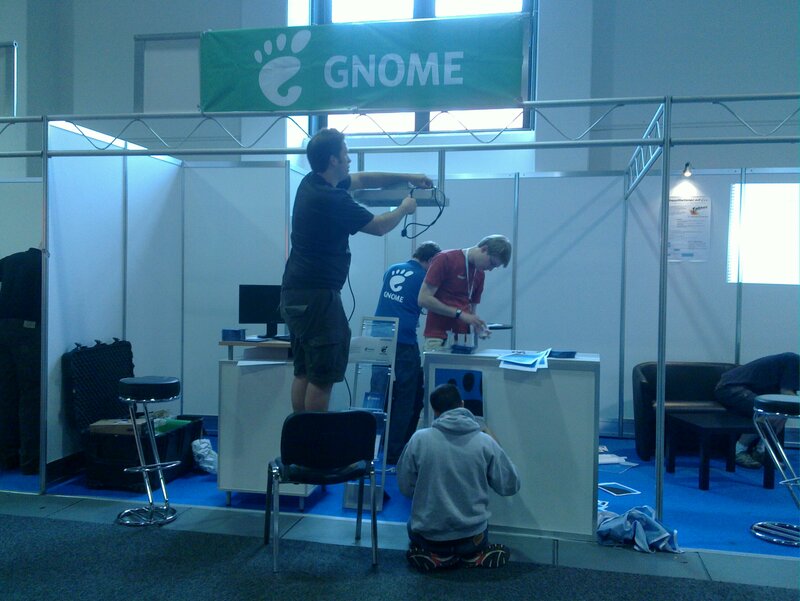 All in all, the GNOME booth went quite well. We had loads of visitors wanting to see the new GNOME Shell and discuss its design. But it was such a busy time that I didn’t even had the opportunity to leave the booth and look at all the other projects. It was, however, pretty nice. It took me a day to recover though. Being at the booth for all the four conference days in a row from (ideally) 09:00 until 18:00, always smiling and entertaining was quite exhausting. To help the GNOME presence: I printed flyers and posters all day before LinuxTag. It was a pain to do, because we are lacking good material. We do have some Brochures to print out, but they are either outdated or in a miserable quality. It definitely needs some quality brochures for GNOME. We have more Posters and some of them are really nice. But I couldn’t render some of them because of bugs somewhere in the stack. Anyway, I managed to print posters on A4 paper which meant that they had to be glued together… To ease poster printing in the future, I uploaded the PDFs I generated to the wiki. What worked well was our booth setup: We had Posters, Sticker, Flyers and (thanks to openSuSE) GNOME 3 Live DVDs to give away. 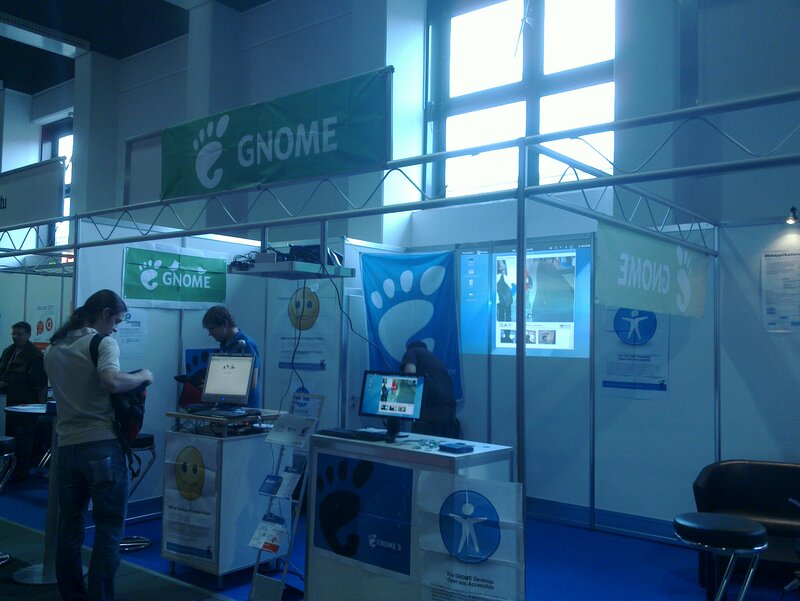 Also our booth looked nice with GNOME banners hanging from the walls. Also, the ordered furniture looked nice to the outside, i.e. a presenter desk, a long cupboard and a bar table together with bar chairs made it look inviting. However, we lacked a small table and some chairs to cater for the many friends that were in the booth and not in front. Thanks to all the helping people. It was really awesome how quickly our booth looked nicely. And fortunately, there is room for improvement. It would have been nice if we brought, i.e. T-Shirts to sell or Posters and Flyers for the GUADEC. But everything was still really okay. I hope we manage to do so well next year, too. So thanks to Canonical for the EventsBox and openSuSE for the DVDs! If you happen to be in the need of some of the DVDs, give me a shout and we’ll arrange the shipping.